ToyPro: Jeroen, could you introduce yourself? Jeroen: my name is Jeroen Ottens, 45 years old, married, father of 3 children. I studied mechanical engineering and am presently employed by ASML. Besides, I have my own company; we create LEGO® models for customers. ToyPro: when did your passion for LEGO® begin, and since when have you been a professional designer? Jeroen: I got my first box of LEGO® when I was about three years old. LEGO® always used to be my favorite toy, first LEGO® system, then the trains and after that LEGO® Technic. When I went to university I quit, but a few years later I moved back in with my parents, temporarily, for a traineeship not far from their place. So I saw my old collection again and in the evenings I built Cape Canaveral with it. I enjoyed that so much that after the traineeship I decided to buy myself some LEGO® Technic. As a student, my budget was larger than my budget as a child, and pretty soon after that I had built a respectable collection again. To my utter happiness, at the time LEGO® was looking out for designers in the Netherlands. To cut a long story short, I was hired and in 1998 and 1999 I worked in Billund as a LEGO® Technic senior designer. Circumstances forced us (wife and first child too) to return to the Netherlands. I then quit building again, for a while. After a few years, my LEGO® itch came back, and it got me going again. During my employment at LEGO® we were going through a transitional period toward modern studless LEGO® Technic. So when I got going again, I had to start from scratch, and learn how to use it to make constructions. When I began to see the light, I also started making my first manuals for model instructions (mostly cars). One day, someone asked me whether I would build a model for a customer. He was the owner of a Ferrari 308 which he really wanted to have built in LEGO® Technic. After I had done that, other requests started coming in too. Beginning of 2017 I decided to start my own company to this effect. We have now moved onwards, two years and twelve large scale models, and we haven’t reached the end yet. ToyPro: what is it you enjoy so much in building LEGO® Technic models? Jeroen: I am a 100% technician, and as such the technical aspect is what counts for me. I try to introduce new techniques into all of my models, to stick to the rules they taught me while working at LEGO® and to find a balance between functions, structure and styling. I can really enjoy simple elegant solutions with these three aspects in perfect harmony. One of the reasons why I enjoy building cars so much is that cars hold quite a few different functions, they require a reasonable degree of rigidity and styling is very important too. It represents the full package of what needs to be built. ToyPro: what, in general, are the greatest challenges in designing? Jeroen: phew, that is hard to answer. Challenges come with certain particular models. My Liebherr LTM11200 presented a challenge in that I had to operationalize as many functions as possible in such a large model. The Miura concept car I am presently working at presents a challenge in the perfect reproduction of the design lines, such as conceived by Marco van Overbeeke. I generally also suffer from a two-third-dip during the designing process. There is this particular moment, at around two-thirds of the process where nothing seems to work out anymore. I cannot draw the lines for the bodywork, or the front suspension is too fragile, whatever. The temptation to quit is strong at those moments. Generally I leave the models for a while, and work on some other design. Then when I come back later, I recognize new solutions and I move forward again. Of course, certain models are easier than others. Sometimes, certain parts seem to naturally adapt to their model, and solutions ooze from my fingers, whereas other models can really represent a struggle. Lately, one of the most complicated models has been the Ferrari Testarossa, I was continuously struggling to find good solutions for its gearbox, its design and the rigidity of its frame. Nothing seemed to happen by itself. Then again, the other extreme is a model which I haven’t commercialized yet, but which simply flowed from my fingers. ToyPro: which software and/or tools do you use? Jeroen: that depends on the type of assignment. If it is a ‘one-of’ design, I build everything in real life. The only tool I use is a pair of pliers, in order to pull out a pin here and there. But when I need to put building instructions together as well, I use LDCad in order to digitalize the model entirely. I outsource the making of instructions, but it gets done with LPub3D. Before, I used to work with the model-scaler of Sariel, but today I build mostly by the eye. It allows for the freedom to accentuate details differently, so that certain lines in the model stand out better. The way we interpret what we see is a very strange process. I prefer suggesting a form with a few well-placed blocks than following the form to perfection with piles of blocks. ToyPro: have you got any targets or projects for the future for yourself? Jeroen: my order portfolio is nice and full, which is a basis for the years to come. My dream would be to cooperate with an exclusive car brand. ToyPro: where do you get your new ideas? Jeroen: firstly, I get a lot of requests to build a certain type of car. Not everybody can afford my prices, but I keep track of what people ask for, which is an inspiration in itself. Besides, I follow all the car-news to find out about the (concept) cars on show in Geneva and other car shows. Sometimes it is a mechanism I want to use, that leads to a model. Thus, one day I would like to make a model for which I need to guide more than two functions through a turntable. It will probably have to be an excavator, something like that. ToyPro: have you got tips for readers who wish to build or reproduce their own model in LEGO®? Jeroen: just do it. There is no school that teaches LEGO® model building, you will have to learn by doing it. Building official models or models of other AFOLs may certainly help in gaining experience. ToyPro: are you a fan of some of the LEGO® designers, and if so, of whom? Jeroen: absolutely. 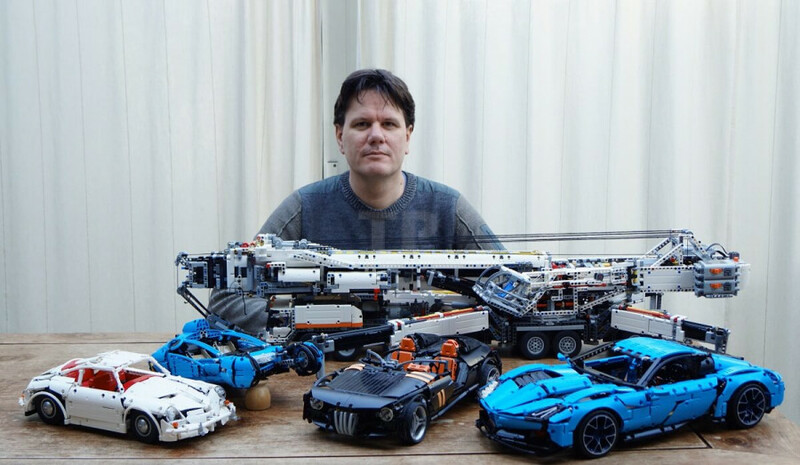 I am a fan of LEGO® Technic designer Uwe Wabra, I used to work with him. Besides, I follow NKubate, also a former LEGO® designer, Brunoji (ToyPro followers know him from his LEGO® McLaren P1 Hypercar MOC) and Madoca. Thank you very much, Jeroen, for cooperating with us for this article. Should you wish to learn more about Jeroen or are you interested in turning your favorite car into a LEGO® model? Please go to jeroenottens.com. You will also find Jeroen on YouTube. If you wish to build your own LEGO® car, ToyPro has a vast collection of LEGO® car parts, and you will find nice standard sets on our page with LEGO® Speed Champions sets.